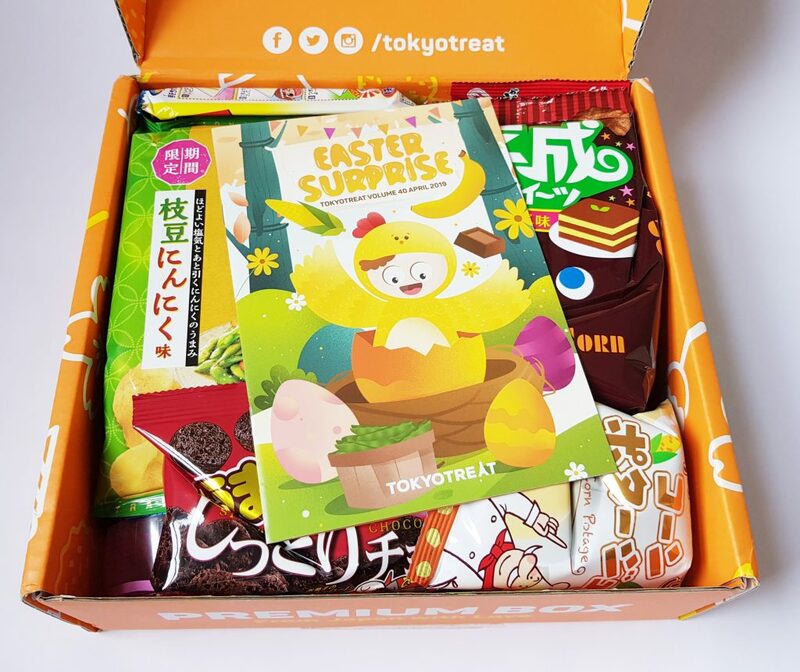 Easter comes in April, so this month’s theme is very appropriate: Easter Surprise! 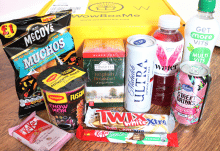 Lots of fruit flavours sound good, plus I know this box has a special edition Kitkat! Here’s the full menu list. 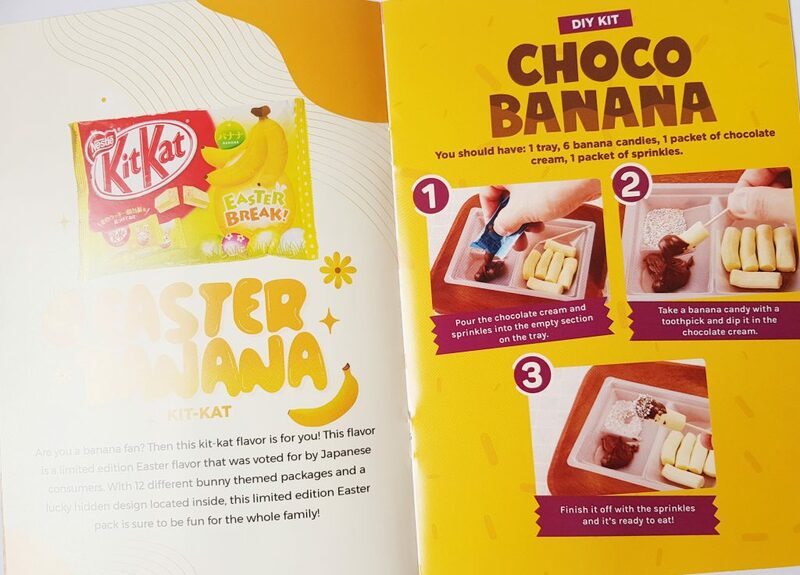 Chocolate and banana feature twice, both for Easter Kitkats, and the DIY candy. 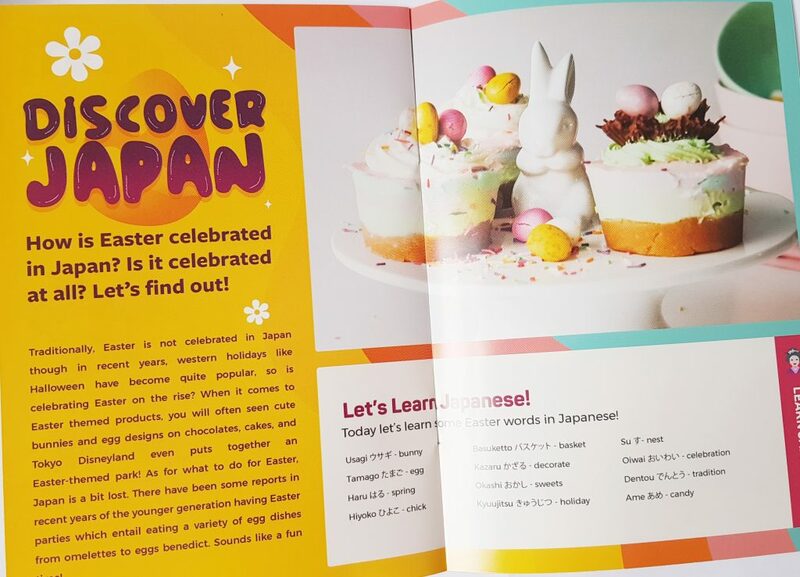 There’s even some information in the booklet about Easter in Japan! Easter Banana Kitkats are the usual crispy wafers with a yellow banana flavoured coating. This is definitely the banana candy-type flavour, so if you’re into that these are fantastic! 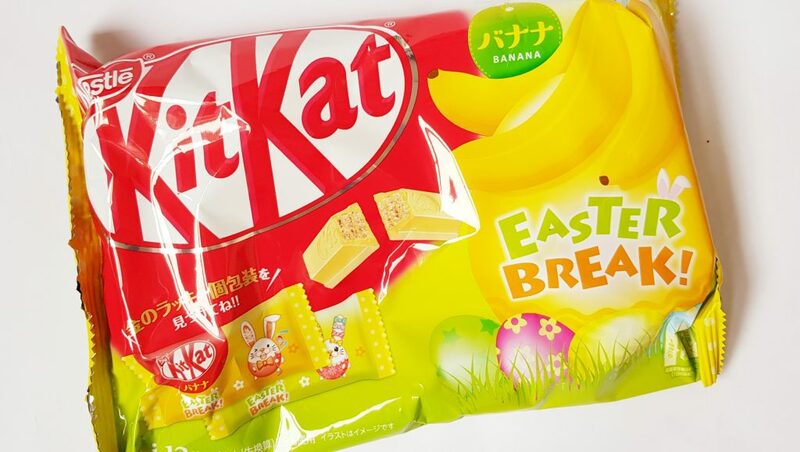 The packaging also has cute bunnies on each one, and there’s even a special golden Kitkat inside for you to find! This month’s drink is actually different from the menu listing. the booklet says Cola-Cola Fanta Yogurt Banana Mix. But the actual drink is way better. 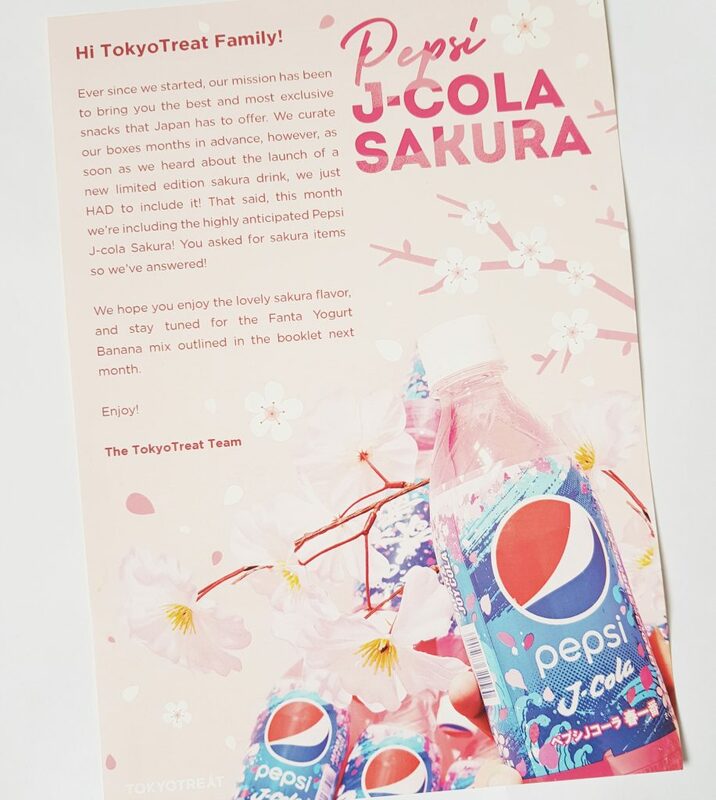 It’s sakura (cherry blossom) season in Japan right now, so this is the perfect drink! It’s so cool they’ve managed to include it this month. 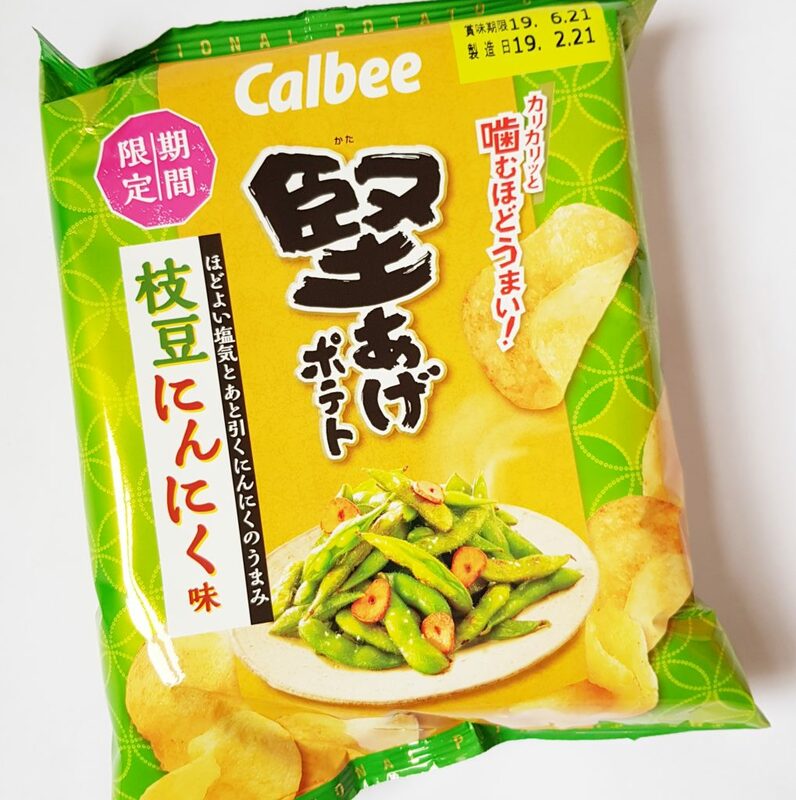 I love garlic, so these Calbee Garlic Edamame Potato Chips are my perfect snack! Savory and salty with a great garlic flavour. Yum! I’m so happy to see Tohato Caramet Corn again! 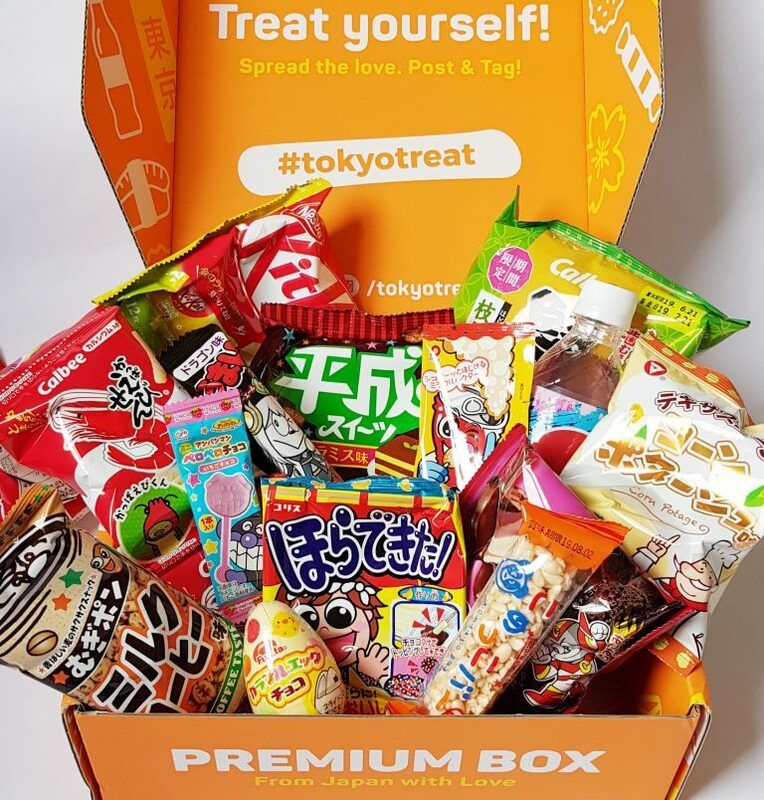 This delicious snack hasn’t been in TokyoTreat for ages, and I’ve really missed it. This version is Tiramisu flavour. 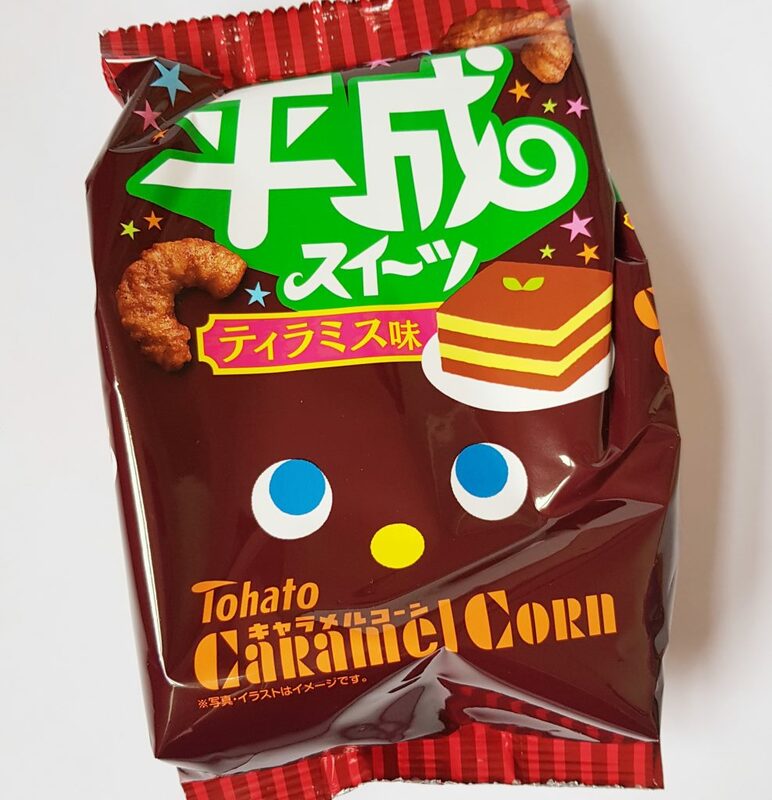 Japanese caramel corn isn’t like popcorn, it’s more like sweet very crispy and light corn puffs. They’re incredible, and very moreish. 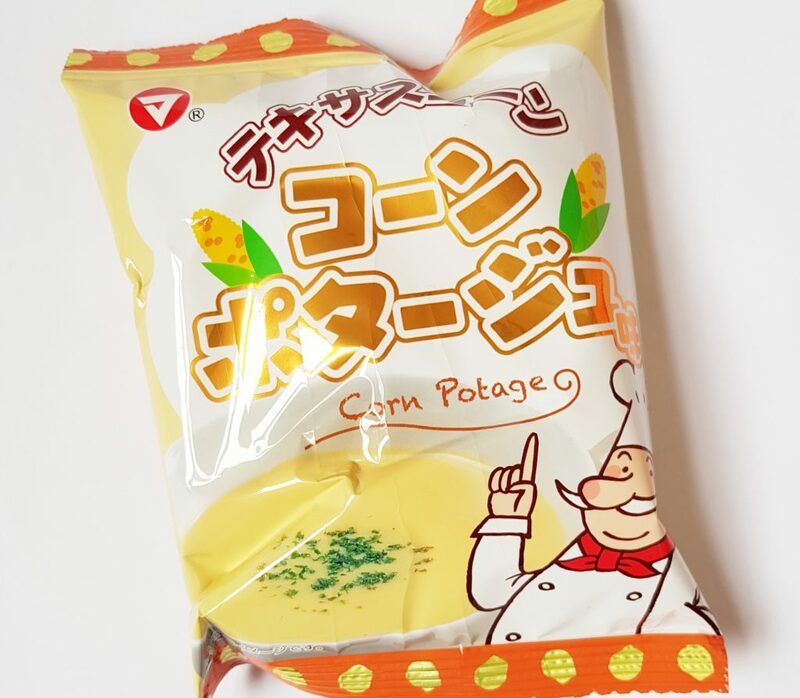 Corn Potage Crisps are crispy corn puffs that really do taste exactly like corn potage. Corn potage is a very popular soup in Japan, made from creamy sweetcorn. 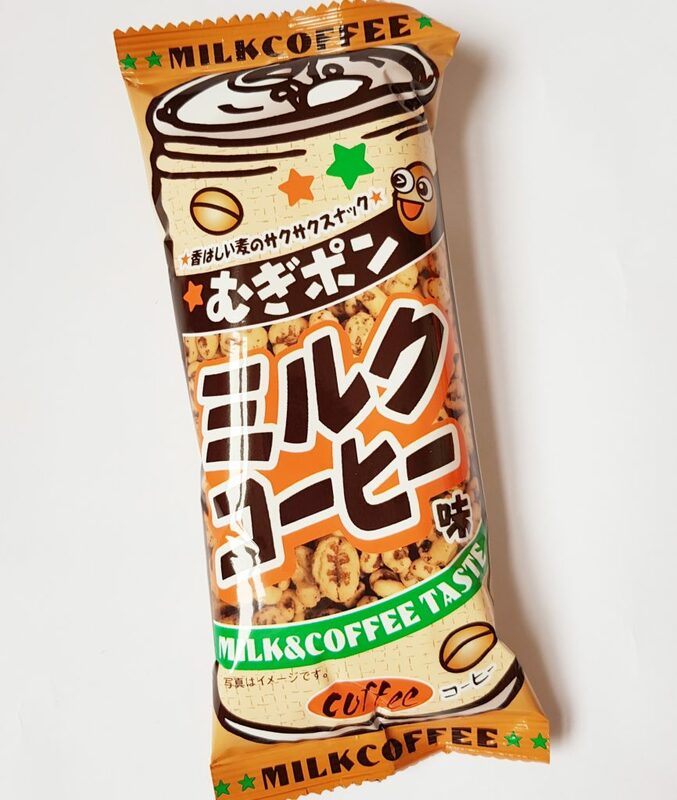 Okin Milk Coffee Crisps are more of an unusual snack. They’re not crisps like potato crisps, they’re little pieces of crispy puffed rice. But they really do taste of milky coffee! This is another snack I haven’t seen in a while. Good Moist Chocolate is one of my favourite Japanese snacks. 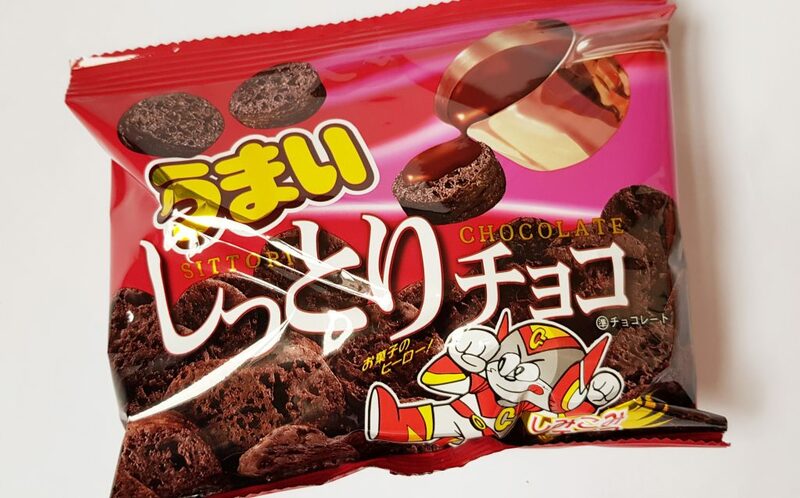 These are little corn puff bites that are soaked in chocolate, and manage to be both crispy and soft at the same time. This is a serious chocolate hit! 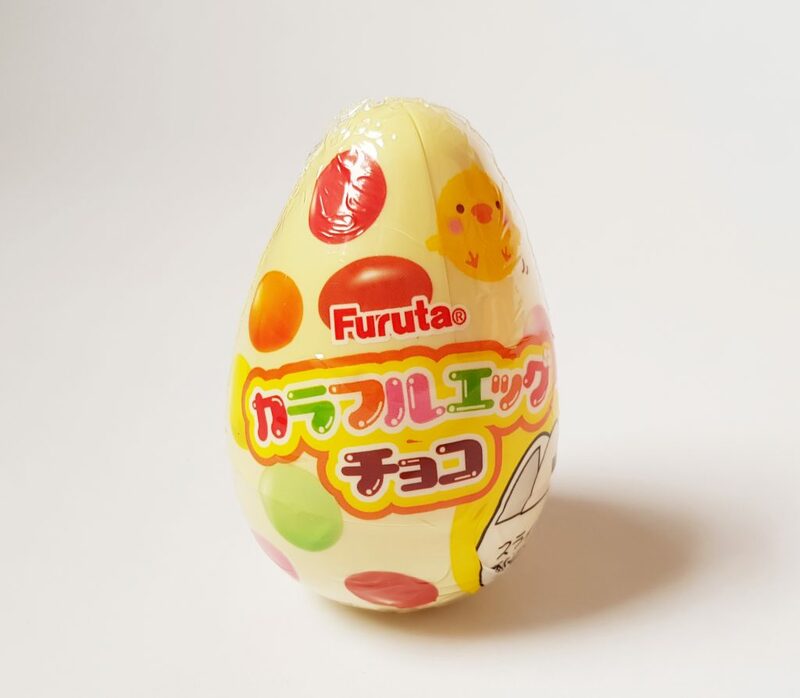 Furuta Egg Chocolate is a real Easter treat! It’s a little plastic egg that contains coloured chocolate beans. One to save for Easter I think! 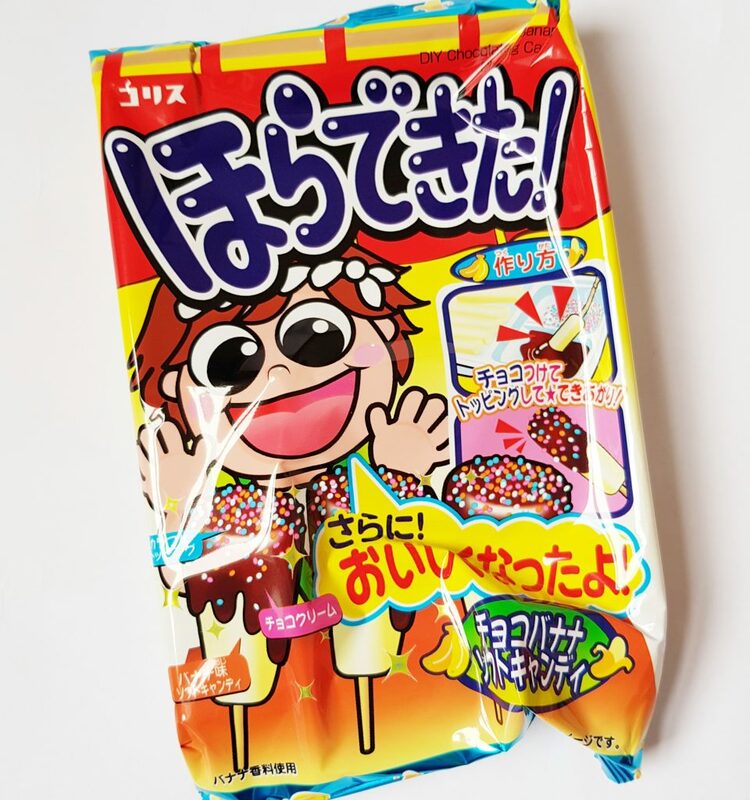 Never mind a chocolate bar, Fujia Anpanman Mini Chocolate Lollipop is a chocolate lolly! 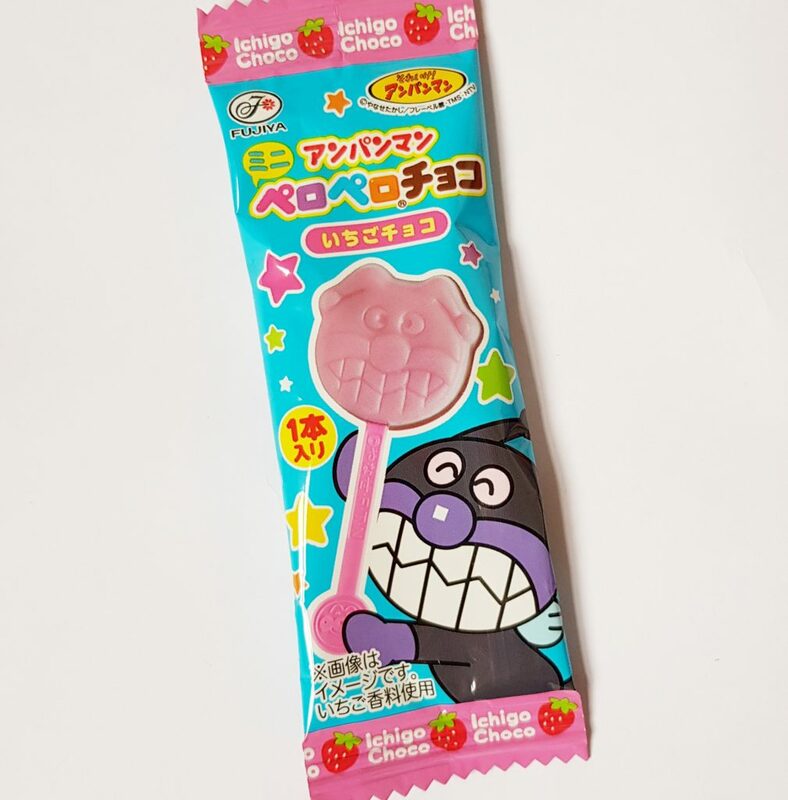 A strawberry chocolate funny face on a stick, and Anpanman is a favourite Japanese superherp character loved by children. 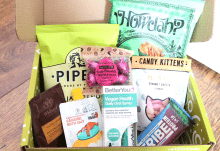 It’s quite a small lolly, so this might be a nice treat for a child, that is if you can bear to share your goodies! 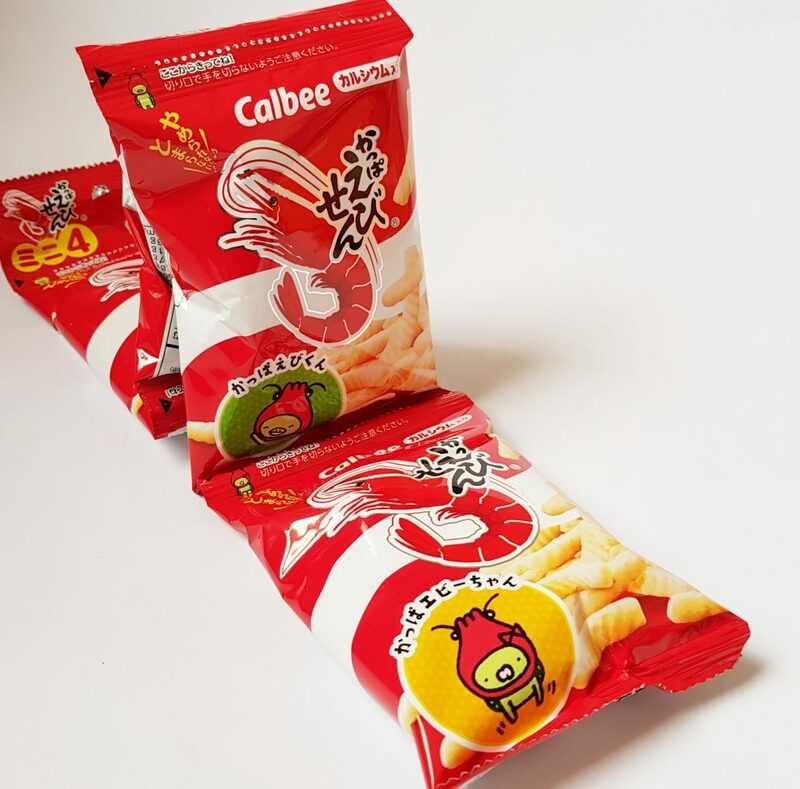 This month’s share pack is Calbee Kappa Shrimp, four little packages of shrimp-flavored crunchy corn sticks. 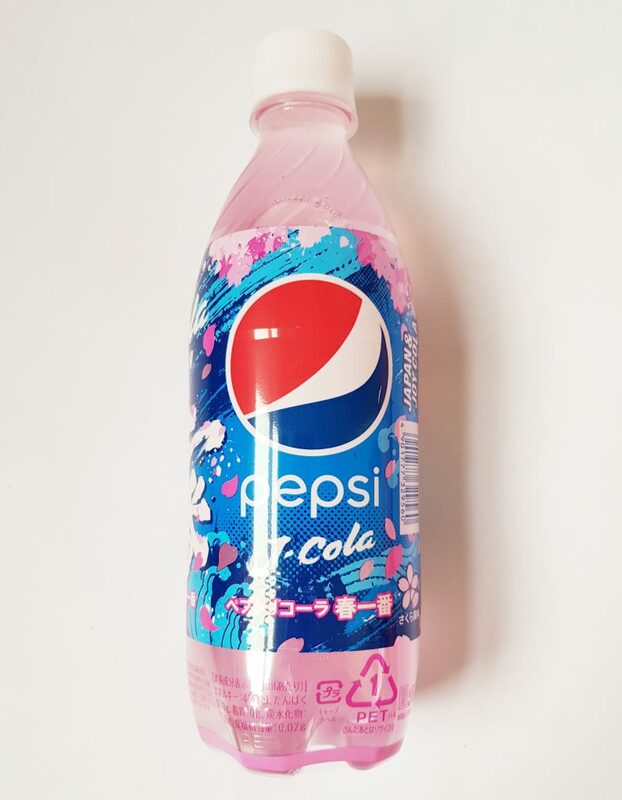 Sherbert Cola Candy Stick is a Japanese version of the Sherbert Dibdab. It’s a cola lollipop that you dip in sherbet! This month’s Collis Chocolate Banana Soft Candy DIY candy kit echoes a favorite Japanese festival snack, chocolate bananas. The idea is very simple, banana dipped in chocolate. This kit gives you banana candy to dip in chocolate cream, plus some sprinkles to decorate. The perfect mini version. This is a really unusual Umaibo – Dragon flavour! 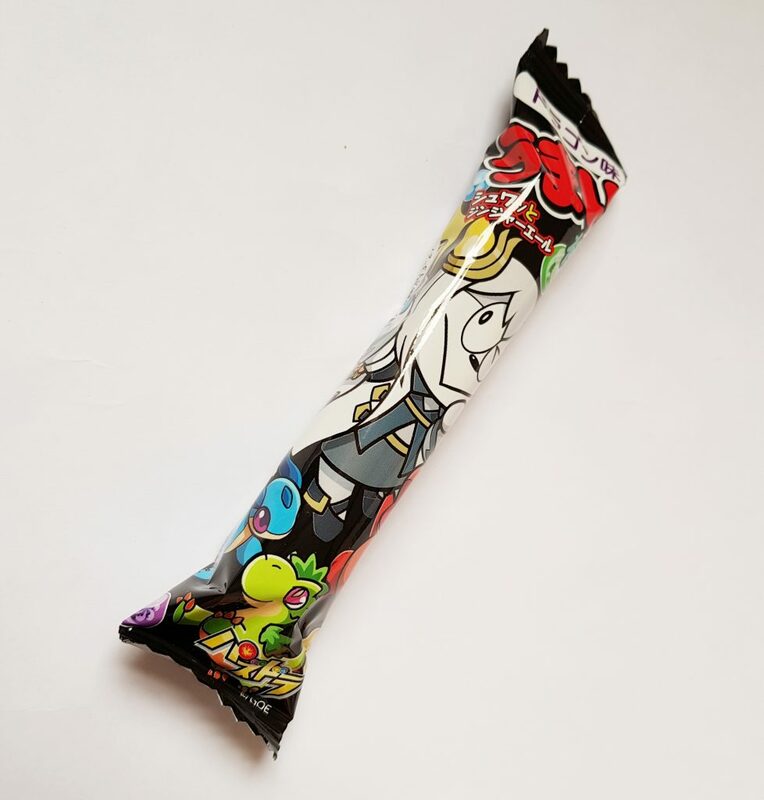 This is a special edition Umaibo (a crunchy corn puff stick) and has be produced in conjunction with the mobile game Puzzles and Dragons. The menu booklet didn’t say what the actual flavour was, because I’m not sure that dragons are real, but I discovered from google that it’s flavoured with ginger ale. That’s going to be spicy, so perfect for Dragon! Finally, a Rice Puff Bar. 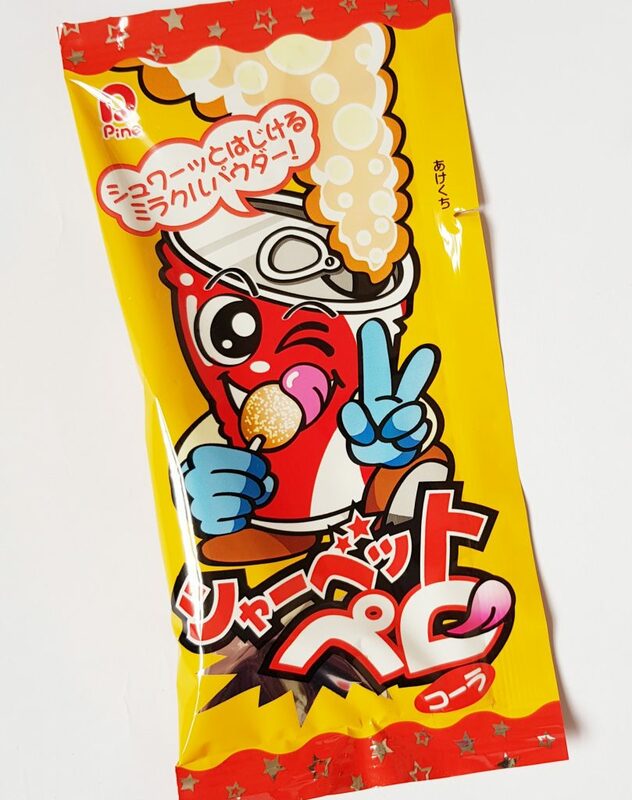 I can’t find this online, which means it’s not something you can find outside of Japan, but the menu tells me that it’s a puffed rice bar with sweet soy sauce. A lovely sweet/salty combination! Banana flavour seems to be a big thing, especially as the original drink was going to be banana yogurt soda. 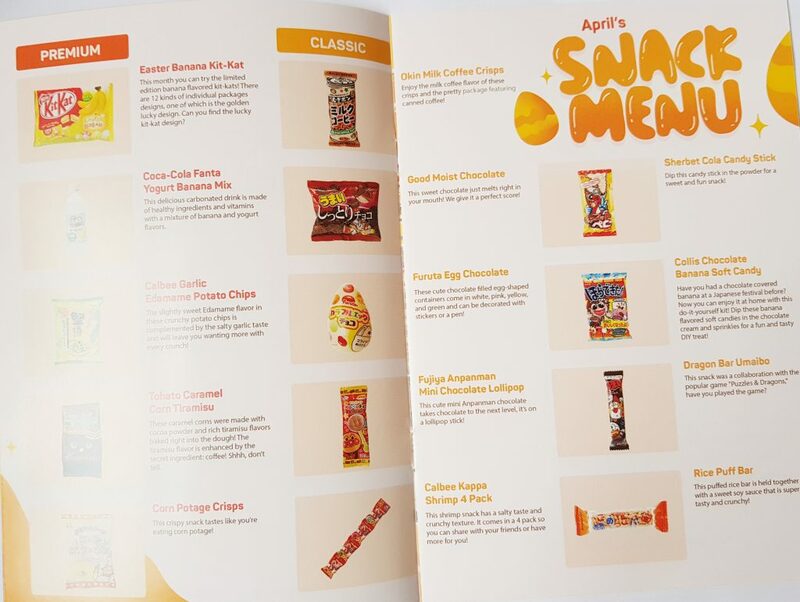 The chocolate filled egg is very cute and I’ll be saving it for the Easter basket this year, though that and the Kitkats seems to be the only proper Easter-themed items this month. I’m not sure how widespread Easter candy is in Japan, though of course Kitkats bring out special editions for everything! 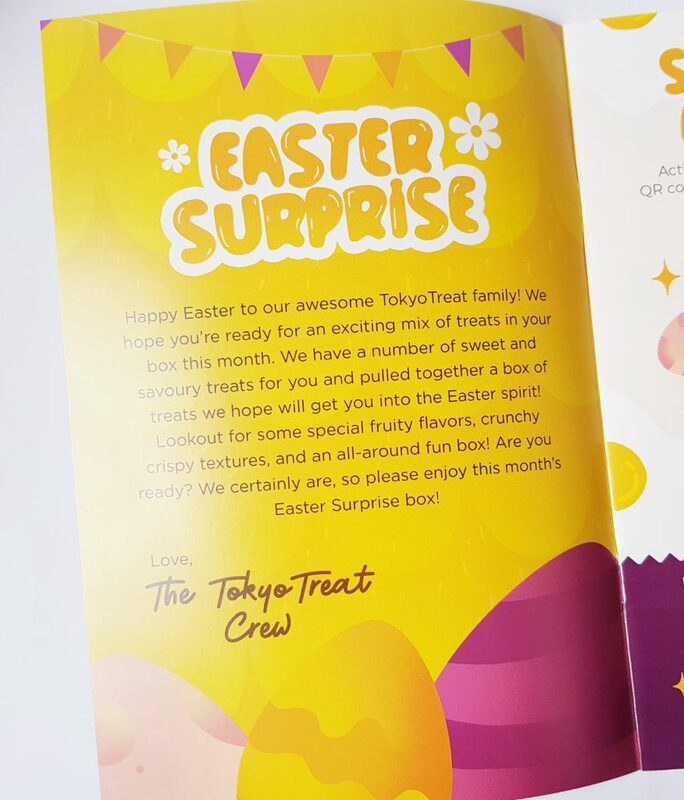 But these boxes will be planned a long time in advance, and I’m guessing that most Easter items won’t come out that long before Easter (unlike the UK when Easter eggs appear on Boxing Day!) The only other thing I would have liked to see is something with Gudetama, who my my favourite kawaii character and an egg! My favourites are the caramel corn and the Good Moist Chocolate, I hope they appear more frequently now, because they’re both amazing! They’re also things for which there is really no Western equivalent at all. You're definitely in for a sweet Easter this year, if you can managed to save enough for the holiday!